Clarington Public Library is proud of its local heritage! We have a variety of materials covering the history of Clarington and surrounding areas, including local newspapers on microfilm and a collection of historical texts about the region. Let us help you get started in your discovery! Ancestry Library Edition is a powerful research tool available for free with your library card! Come to any library branch and use our public computer stations to search for your ancestors by name, country and date range to find original documents and more. 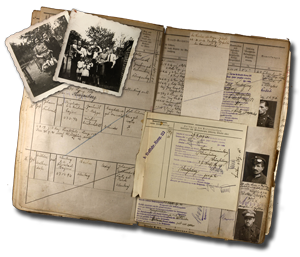 Documents that can be found on Ancestry include census records, voter lists, birth, marriage and death records, military records, immigration records, travel records, newspaper articles, photos and maps. Please note this resource is available in-branch only. Clarington Public Library has begun digitizing our newspaper collection in partnership with Clarington Museums and Archives, and a portion is now available online! Visit the microfilm collection, bring in your own microfilm reels, or request microfilm reels from Library and Archives Canada. To help your search, our Microfiche Surname Index is available at the Bowmanville Branch for newspapers ranging from 1868 to 1926. The Durham Region Branch of the Ontario Genealogical Society also has an Surname List for 1926 to 1934. Cemetery Records for the Clarington area are available in the Bowmanville Branch upon request. They cannot be checked out, but you may purchase copies directly from the Ontario Genealogical Society's Durham Branch by visiting their website and selecting the area you are interested in. For more in-depth research assistance, Clarington Museums and Archives may be able to help. Visit their Sarah Jane Williams Heritage Centre location, call or email for more information. The Newcastle Village and District Historical Society is located within Newcastle's Massey Community Hall. They are open to the public Tuesdays and Saturdays from 9:30 AM - 12:30 PM and by appointment. The Durham Region Branch of the Ontario Genealogical Society meets approximately once a month at the Main Branch of the Oshawa Library. Their members focus on preserving information that will be useful for anyone doing research on ancestors from the Durham Region, and provide a sound base for researchers living here who have ancestors in other areas around the world. The Library's Microfiche Surname Index is available at the Bowmanville Branch for newspapers ranging from 1868 to 1926. The Durham Region Branch of the Ontario Genealogical Society has a digital Online Surname Index available online for 1926 to 1934. OurOntario.ca is an online resource that allows users to search across hundreds of sites – digital collections of libraries, archives, museums, historical societies, community groups, government agencies, and content organizations. Discover people, places, events and objects about Ontario, and from Ontario organizations. It's easy to find photographs, maps, videos, audio recordings, government documents and other media. The national library of Canada, Library and Archives Canada has a wealth of databases and resources to assist in your search, including an Ancestors Search.